Have you ever been confused by why the same Apple part is referred to by different part numbers? All Apple service spares are identified by Apple part numbers but there are different types of part number and if you are repairing Macs specifically, it is useful to understand the way they work. The following article explains the different types of Apple part numbers, how they work in practice, and some of the oddities that arise from this. There are two groups of part numbers which we call the GSX numbers and the production numbers. GSX part numbers are the ‘official’ part numbers because within the closed citadels of Apple Authorised Service Providers (AASP), only the GSX part number is used or recognised. As far as we know, there is no official term to differentiate them from production part numbers. GSX numbers define a logical part rather than a physical one and never appear on the part itself. They represent a part with a particular specification. What this means in practice is that although a particular part may go through multiple tweaks and revisions during it’s life span, if it’s specification and definition are unchanged, the GSX part number stays the same. We refer to them as GSX because they are the number used to identify the parts on Apple service manuals and when AASPs order through Apple’s Global Service Exchange web site (GSX). Another implication of this is that parts only have a GSX part number assigned if they are available as a service spare. An example would be a MacBook Pro display which is only supplied by Apple as a complete assembly. This has a GSX part number but no such number exists for the components within it i.e. the lid panel, glass panel, LVDS cable, iSight cable, iSight board, LCD panel or hinges. For such assembly components, only a production part number can be used to identify them, if one exists. GSX part numbers are of the format 999-9999. The first three digits identify certain categories of parts and the last four are assigned sequentially and therefore give an indication of the chronology of release. There are a relatively small number of values used for the first three digits. Here are some examples although this is not a comprehensive list. 922- , 923- : Not available through GSX as exchange. This is referred to as being stock only. 076- : generally used for kits or tools. Also stock only. 661- : Available to AASPs as exchange through GSX. If the specification for a particular part changes during its life span then a new GSX part number will be assigned as a substitute part number for the original. This can happen when a new product range uses an improved design of a part but that part is still backwardly compatible with the previous range. In this case, rather than stock and supply two different service parts, Apple will define a new GSX number as a substitute for the original. This is why there can be multiple GSX numbers used to refer to the same service spare e.g. On thebookyard.com. If a particular part is used on a subsequent product range but the specification of that part remains the same, the GSX number remains unchanged. Production part numbers are those that actually appear on the part themselves and uniquely identify a particular design or revision of part. They are of the format 999-9999-A where the last letter is used to identify minor revisions. If Apple sources a part like a power supply from multiple companies, each company’s version will have a different production part number printed on it. Every time there is any change to the design or manufacturing process, the part number on it will change. There can therefore be many different production part numbers appearing on different examples of the same part i.e. a new service spare from a Apple may have a different production part number on it to the number on the original part it is replacing. Most Apple service parts will have a production part number on it. This most commonly starts 820- or 821-. Other common prefixes are 630- and 632-. 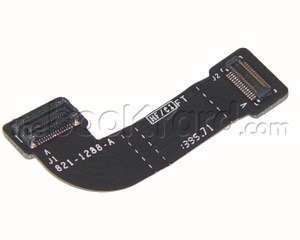 In some cases a single part, like a flex cable, may have two different production part numbers on it. We are not really sure why this is. Larger assemblies which comprise multiple components, such as top case assemblies or complete displays, may have multiple production part numbers in different places and this is because individual components used to produce the whole assembly may have their own numbers. Conversely, sometimes different variants of the same part will carry the same production part number. This is most notable with logic boards. It is usual for different speed logic boards within the same product range to use exactly the same PCB. The only difference is that a different processor chip or GPU chip is fitted for different versions. In this case, the production part number screen printed onto the PCB will usually be the same for all processor speeds within that range. Even stock parts available for purchase outside of the Apple channel such as optical drives or hard drives will carry an Apple production part number if they are from a Mac or an official Apple service spare. The part may be identical to the non-Apple numbered version but it may have been modified or loaded with firmware specifically for Apple. An example would be the Panasonic UJ-875 that Apple used in some of the Intel iMacs. Stock Panasonic UJ-875s could be bought on eBay or from Panasonic distributors but these would not work because Panasonic produced a modified version for Apple with a longer pickup distance to allow the drive to be set back further within the case. Even more confusingly, Panasonic also supplied Apple versions with the normal pickup distance for use in MacBook Pros. The key to identifying which version was with the production part number.